Aries, horoscope for June 2019 shows that minor but interesting plots may affect your life significantly. It seems that sport, mainly running or hiking, will influence your activities. It is quite possible that Aries will meet a professional guide or at least an experienced traveller who will ignite the flame in your heart (Aries may easily decide to fly around the world or share the rest of your life with him/her). June horoscope portrays the mental condition of Aries roughly as follows: Your feelings and thoughts will be like corn seeds. If they get too close to the heat (love, inspiration), they will start exploding like a real popcorn. In June Aries is waiting for a real mental fireworks. "Have a Break, Have a Kit Kat", says one ad. But the horoscope knows that only half of the slogan is true. Certainly no chocolate bar will save Taurus. June is a challenge to stop and think twice. Learning and absorbing new knowledge or skills will be more important than ever. Taurus, if you do not want to look like a pink doll (meaning appearance matters only), you should focus on lacking depth in your life. Taurus, pay attention to efficiency as well. Do you clean the floor with an ordinary broom, even if there are smart mops? Do you still use Windows XP because it is "enough" to write letters, e-mails and print? Or do you walk/ride the same route for many years and never even thought of asking navigation if there is a newer and shorter one? Well, in June the horoscope encourages Taurus to investigate and find out what you can do better and more efficiently. According to June horoscope, it is time to clean your way in all important relationships; be it love, colleagues, or relatives. Gemini, at the end of the month you should relax with the feeling that the path ahead is beautifully straight and clear, without any apparent obstacles. How to do it? It is necessary to achieve really healthy self-esteem. Let others know that Gemini is not going to beg for mercy anytime soon. On the contrary, you have to emanate power and pride. It must be clear that others have to curry favour with you. With a little exaggeration, even if you were forced to rent your own house and sleep temporarily on a bench in park, you would look and feel like a genuine aristocrat. In June all the difficulty and misunderstanding will be similar to a small and barely visible fly that you can chase away with one simple wave of your hand. June 2019 encourages Cancer to think about the coming summer. A fish cannot live without water, a car needs gasoline to move, a kitten drinks milk and Cancer will gain energy thanks to the warm months – they may provide Cancer with vitality that he or she will turn into an useful and fulfilling activity. The June horoscope encourages to charity. It is desirable to help family and friends. Alternatively, focus on many unfortunate people who have stuck on the street or in a refuge. Cancer should also take another look at loan issues. Consider whether you do not owe more than you can repay in the long term. Or whether there is a chance of obtaining a refinancing loan from a rival bank. In June Leo may resemble a cute kitten to any bright observer. Choosing a new eau de toilette fragrance is simply a better and funnier task than, let's say, showing teeth in the Roman Coliseum and tearing poor gladiators apart (imagine a corporate meeting and envious colleagues instead of gladiators). The horoscope says June will become a bow for shooting arrows into the next months of 2019. In June, Leo is simply predestined to make a significant leap that will fall further into the future. You may write a key letter to your superior or ask for a better job. Maybe you will meet a new love or a new friend, probably at a cross-country race or at a coffeehouse (nature and sport event). And maybe you will pull a great idea out of your pocket that inspires the whole world. 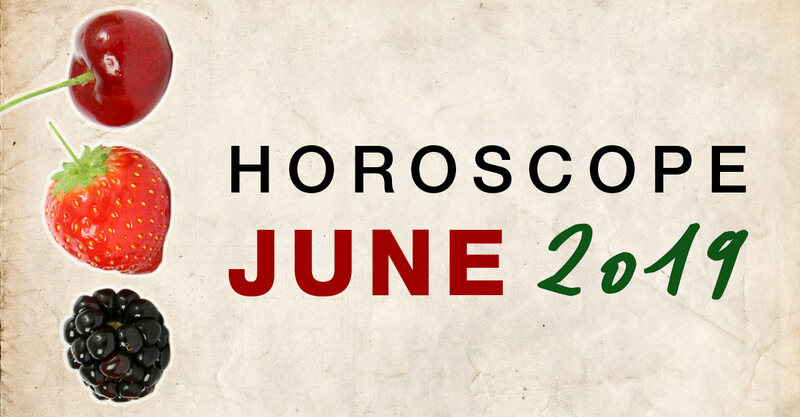 June's horoscope shows that people born in Virgo may be particularly sensitive to rhythm and music. Virgo loves symmetry and tidiness more than other signs of the zodiac and woe to the one who tries to disturb such harmony and balance. If someone near decide to add a few false notes to your personal harmony (scattered clothes, expired food in the fridge, infected computer, unpaid bill, etc. ), Virgo, as a truly prudent conductor, will recommend to set up his/her own "orchestra", because playing cacophony is simply not allowed. And indeed, Virgo may not be inclined to melancholy at all; especially when there is enough sun in the sky. Expect enjoying June according to Walt Disney's playful melodies, rather than as a funeral march by Frederic Chopin. June 2019 heralds that Libra will get rid of a certain burden. You will "unload the cargo", either mental or physical. However, the horoscope reminds Libra that it is too early to rejoice because Libra likes to fill both bowls of scales to regain the balance back. This means that even if you resolve an unpleasant or distressing matter in June, there will be a natural urge to put another new challenge into the empty pan of scales. Libra understands that love and human relationships are a series of moments that follow each other like morning, noon, evening, and night – like inhale and exhale. Horoscope predicts that if one day you have to face an attempt of shame or humiliation, be sure it will be followed by a very pleasant time full of encouraging impulses. Libra, you have to step forward to meet them. Scorpio, according to the June horoscope, you will be the champion of debate and conversation. Stay calm even if your mother-in-law would like to say few vicious words. Scorpio, her sharp comments will surely fail. Even the criticism from your boss will be effective approximately as a windshield washer fluid. Why? It foams, but in a while the glass is beautifully clean and clear. In June 2019 Scorpio will pass similar tests. But one minute of crying gets a whole day full of joy and brilliant self-confidence. Or again, a single quarrel or friendly dispute gets a day of fruitful thoughts and even a week of bliss, enlightenment, insight and understanding . This ratio is definitely worth it! Sagittarius, the June horoscope shows that your focus on performance is distinctive and visible as a flag on a mast. If there is a month in 2019 when you can correctly identify a purchase at a great discount price (an ideal investment opportunity of any kind), then it is now. Similarly, Sagittarius can thrive in love and partnership. Sagittarius simply knows what a loved one desires more, whether a romantic dinner, attending a diving or an archery course, or if he / she would like shopping the whole weekend and completely upgrade your household. Horoscope portrays Sagittarius as a person who can recognize and preserve true values and who will be a pioneer or at least a cute romantic dreamer that, however, may charm others completely. Capricorn, the breakfast will become the centrepiece of every day in June. Best ideas will strike you right in the morning. Horoscope suggests that Capricorn will succeed in business as well as in social activities. Your friends will often look like a faded black and white photo. Simply because Capricorn may be a geyser of wit and wisdom, a fountain of endless stories. In June, Capricorn can easily resemble a bottle of champagne that cannot stop the flow of delicious bubbles after uncorking. According to the horoscope, Capricorn can do wonders. To turn an icicle into a hot torch may not be just a fantasy! Love and closed eyes can help you a lot. June is a mysterious box. Aquarius will open it in the beginning of the sixth month and he or she will discover one surprise after another. But not all of these will be the pleasant ones. You may find that impregnation for sneakers is better to use before the water will soak in after a rainfall. Aquarius will also start to understand that problems are mainly addressed by conversation and action, rather than by silence and observation. Finally, Aquarius will also recognize that a beautiful seal on paper is not a 100% guarantee of its authenticity and value. Well, and it's just the same with people. In June Aquarius may appreciate a lot of new and previously unknown shades of love and welcome precious details of human relationships. A fertile plantation, a new wind in the sails, a big leap, a spring of activity – all these are the terms to describe how June 2019 will pay off to Pisces. Pisces will have the ability to name problems but also to listen carefully and recognize the difficulties that are emerging on the horizon. Other zodiac signs may be honoured if Pisces choose to devote their valuable energy to them.